The self-style Islamic State group has claimed to have carried out a suicide bomb attack in eastern Afghanistan that killed at least 33 people and injured more than 100. Afghan President Ashraf Ghani said the group claimed responsibility for the bombing, which if verified, would be the first major attack claimed by the jihadist group in the country. "Who claimed responsibility for horrific attack in Nangarhar today? The Taliban did not claim responsibility for the attack, Daesh (IS) claimed responsibility for the attack," President Ghani said. 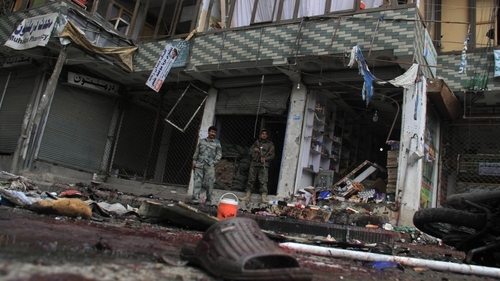 A person purporting to be an IS spokesman said in a call to AFP that the group claimed responsibility for the bombing outside a bank in the eastern Afghan city of Jalalabad, where government workers were collecting their salaries. An online posting allegedly from the group made the same claim, which could not be immediately verified. The UN gave a higher toll, saying 35 people had been killed. President Ghani strongly condemned the attack, which saw children among those killed, his office said in a statement. "Carrying out terrorist attacks in cities and public places are the most cowardly acts of terror by terrorists targeting innocent civilians," President Ghani said. The bombing comes as Afghanistan braces for what is expected to be a bloody push by the Taliban at the start of the fighting season. However, Taliban spokesman Zabihullah Mujahid denied responsibility. The militants have stepped up attacks on government and foreign targets since Washington back pedalled on plans to shrink the US force in Afghanistan this year by nearly half. The Taliban has seen defections to IS in recent months, with some insurgents voicing their disaffection with their supreme leader Mullah Omar, who has not been seen since the 2001 US-led invasion of Afghanistan. The Afghan government has also raised the ominous prospect of IS making inroads into the country, though the group that has captured swathes of territory in Syria and Iraq has never formally acknowledged having a presence in Afghanistan.